OGM delivers Australian trade skill vocational training with accredited trainers, contextualised to local industry needs at costs that enable a high volume of trainee graduates. Our key objective is to deliver hands on trade skills training to globally certified standards combining in class, and intern on-site training to produce proven ‘work ready graduates’. Courses are selected to ensure pathways to work force placement where there is industry demand. We deliver training in the construction, energy & resources sector and are certified by the National Skills Development Corporation (NSDC) and Construction Skills Development Corporation (CSDCI) imparting trade craft skills training certified to both Indian National Occupational Standards, and international accreditation through Australian TAFE certification. The courses that we have run through two, four and six month training units deliver proven “work ready” graduates. Our business model is designed to meet content levels in India and are very cost effective. We deliver courses inclusive of training content, trainers provided with the required training and certified to Australian standards, independent Government certified assessment and job placement service, or any combination therein. Our model works with local partners including Government and private sector whereby 30 – 40% of the course work is delivered in classroom and technical environments, and 60 – 70% delivered on site in real work situational exposure that demonstrates skills application and capability under supervised working situations. To date the majority of people we have trained in the vocational courses, have been placed in India and our main partnership client is Leighton India (Construction) part of the CIMIC Group. 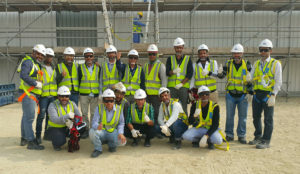 For Leighton we have trained almost 4,000 workers covering safety and induction, masonry (block and render) MEP, HVAC, Formwork carpentry, Steel fixing, Scaffolding, Rigging, and specific courses for projects when requested by Leighton. We track before / after skills productivity and efficiency with site supervisors and in 100% of cases we have delivered a minimum 50% improvement and up to 100% measured by Blocks played, M2 of scaffolding erected, KGs of steel rebar tied, etc.